The Food Police rob you of your ability to choose and enjoy that is physically and emotionally satisfying. Fight back against these harmful messages and tune in to what your body needs. The Food Police rob you of your ability to choose and enjoy food that is physically and emotionally satisfying. Fight back against these harmful messages and tune in to what your body needs. Although each of us is born with the ability to eat when we are hungry and stop when we are full, most of us fall prey to messages from society about what we can and can’t. Sometimes these messages become so ingrained in our minds that we don’t even notice them. In Intuitive Eating, we call these voices The Food Police, because they provide us with rules that affect what, when and how much we can or should eat. Are you ready to learn more about how to discover and ditch your food police? Read on…. Did you know that we make more than 200 food-related choices every day? When we decide what to eat, we take into account taste, temperature, texture, and/or how much a food tends to satisfy us. But sometimes our decision is affected by messages from others or even those in our heads. However, sometimes these voices are harmful, and, in Intuitive Eating, we refer to them as the Food Police. often spark feelings of guilt and shame. Who are your Food Police? Learning to identify and challenge your food police is a key step in becoming an Intuitive Eater. If you’ve been reading along with my Intuitive Eating blog posts, you’ll know that Intuitive Eating is about tuning IN to your body and its needs. However, the messages the Food Police provide take your individual needs out of the equation. Do any of these Food Police sound familiar??? Patty the Paleo social influencer: Patty has a huge online following as a coach for those wanting to follow a Paleo lifestyle. She wants everyone to benefit from her personal experience and promotes the idea that Paleo is the ONLY way to eat. Patty doesn’t let the her lack of nutrition degree stop her from preaching the dangers of not following her lifestyle. Weight Watching Wendy – Wendy is a long-time Weight Watchers member. You’ve been friends with her long enough to learn about exchanges, points, etc and she is sure to tell you that “it’s not a diet.” She meticulously calculates what she can and can’t eat and chastises herself for ‘being bad’ when she eats outside of her meal plan. Clean Eating Cathy: Cathy eschews anything processed or artificial, and while you might agree with some of her thoughts, you are starting to think she is taking it too far. It’s hard to eat out with her, because most restaurants don’t meet her exacting standards, which seem to increase by the week. Sometimes, she shuns food altogether and just has a cup of herbal tea and some nuts she brought with her. Do you notice that you make different food choices when you are with them or when you have these thoughts in your head? If you answered “Yes,” as most women do, it’s time to start fighting back against these unhelpful bullies that are standing between you and your goal of finding peace and joy in food as an Intuitive Eater. So, how do you challenge the food police? Identify them: Some of my examples above might resonate with you, but maybe they don’t. Perhaps there are other voices that dictate what and when you eat. Grab a journal and spend a few days noticing when your food choices are affected by those external or internal voices. Create statements that challenge your food police. The key element to creating these statements is to reflect on your eating experiences with curiosity rather than judgment. Curiosity allows us to explore deeper; judgment creates feelings of shame that prevent us from finding the true meaning. 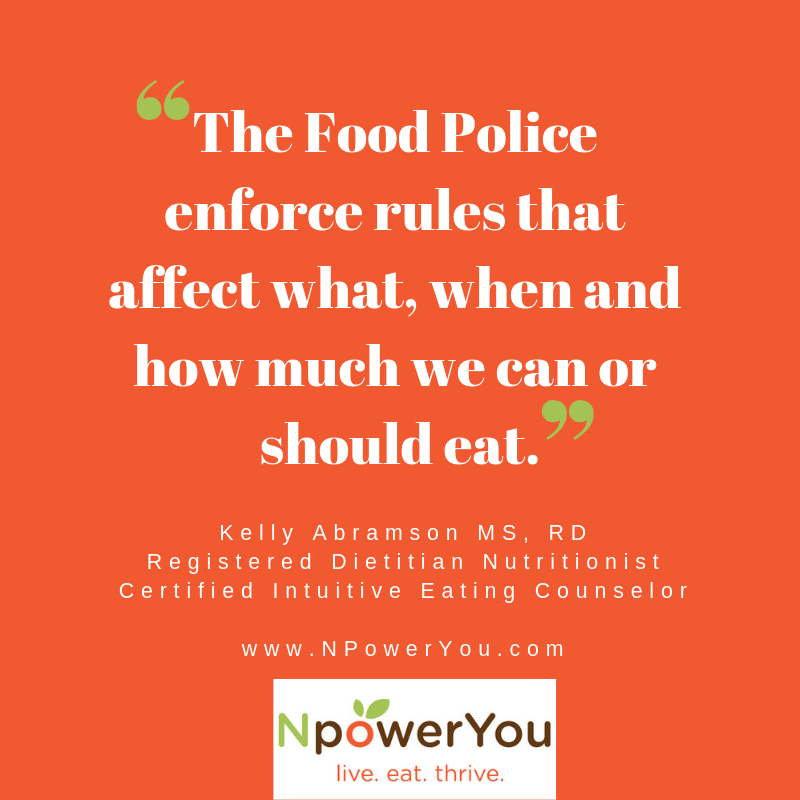 Finding those food police voices and examining their role in your food choices allows you to tune IN to your body, while tuning OUT unhelpful messages that affect your body to eat intuitively – an integral part of becoming an Intuitive Eater. Are you ready to start challenging your Food Police? You can use the steps above to start identifying and fighting back against YOUR food police. But perhaps you need some more guidance as you begin working on Intuitive Eating. Maybe you’ve started reading about Intuitive Eating, but you feel anxious about quitting diet culture and starting this journey all alone. That’s where I come in! I help women just like you every day as they learn to tune in to their bodies and eat food that is physically and emotionally satisfying. Are you curious about what it’s like to work with a professional on Intuitive Eating? I offer a complimentary discovery phone call to those who are interested in exploring working with me. Click here to schedule your call! We can discuss the areas where you are struggling, your goals for the future, and outline a plan to get you on your way towards finding joy and peace with food and your body. Isn’t that worth working for? Stay tuned to the blog as I continue to explore Intuitive Eating. Next time I’ll be talking about Principle 5: Feel Your Fullness.